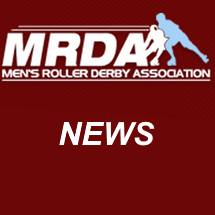 The Men’s Roller Derby Association is proud to announce the following changes to our Executive Board of Directors, who are responsible for overseeing the MRDA as the international governing body for men’s roller derby. Jimmy Rage has stepped down as president. Sin Diesel is acting in a caretaker capacity in this role for the short term. D Baggins has stepped into the Vice President role, vacated by Sin Diesel. Commando Roll is the new Director of Public Relations after Lumberjerk stepped down. Mooose was an important part of the development of MRDA Central and has stepped down from this key role. Now leading our Information Technology team is Dev Null. The MRDA would like to thank Jimmy Rage, Lumberjerk and Mooose for their tireless efforts on behalf of the MRDA members and wish them well for the future.